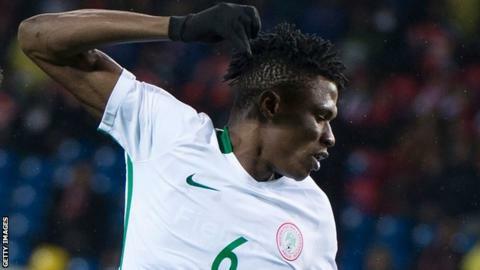 Defender Stephen Eze has been rewarded for his good performances at the African Nations Championship (CHAN) with a call-up to Nigeria's senior national side. Defender Stephen Eze and forward Gabriel Okechukwu have been included in Nigeria's 28-man squad for the friendlies against Poland and Serbia later this month. Eze, 23, who plays for Bulgarian side Lokomotiv Plovdiv, and Akwa United's Okechukwu, 22, both starred as the Super Eagles B finished runners-up at the 2018 African Nations Championship (CHAN) in Morocco. They are among four new additions in coach Gernot Rohr's squad for the two World Cup warm-up games. Nigeria will play Poland in Wroclaw on 23 March and Serbia four days later at Barnet, England. Torino midfielder Joel Obi and Egypt's Al Ahly striker Junior Ajayi are also named as Rohr seeks to blend them with the core of his existing squad. "The coach has named a strong squad for these important friendlies as the team prepare for the World Cup in Russia," Nigeria Football Federation (NFF) spokesman Ademola Olajire told BBC Sport. "It's the first two of six crucial friendly matches planned for the team by the NFF." Rohr has also included experienced Premier League quartet of Victor Moses, Kelechi Iheanacho, Wilfred Ndidi and Alex Iwobi, who scored twice in Nigeria's 4-2 friendly win against Argentina in November. William Ekong is hoping for continuing success with the Nigerian football team. Nigeria's other confirmed friendly fixtures include DR Congo in Abuja on 28 May, England on 2 June in London and then the Czech Republic four days later in Austria. The West Africans have chosen the eastern European oppositions Poland, Serbia and Czech Republic with the hope that they will provide ideal preparation for their opening Group D game against Croatia in Russia on 16 June. The Super Eagles will be making a sixth appearance at the World Cup tournament in Russia. They reached the round of 16 in 1994, 1998 and 2014 but exited the 2002 and 2010 tournaments in the group stages.